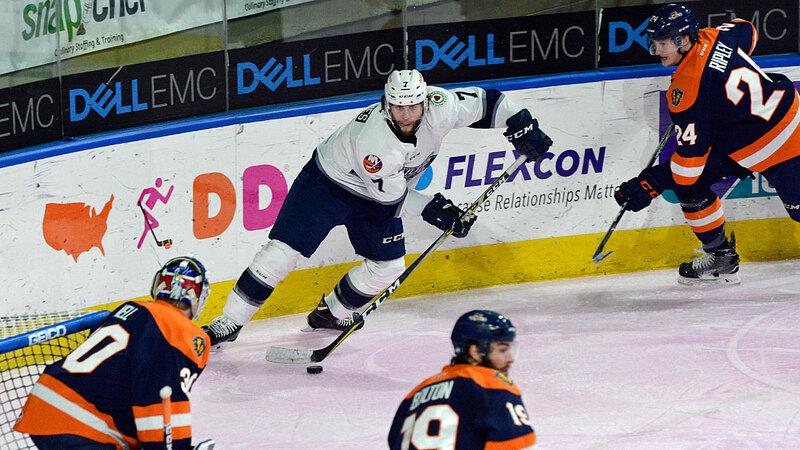 Worcester, MA – The Worcester Railers HC (21-19-3-3, 48pts) kicked off a 3-in-3 home weekend with an exciting 3-2 come-from-behind win over the visiting Greenville Swamp Rabbits (15-30-3-2, 35pts) in front of 3,491 fans at the DCU Center on Friday evening.The Railers host PINK in the RINK Night presented by Rampco Construction and JLA Contracting with a 7pm faceoff vs. the Wheeling Nailers. Tyler Barnes (2-0-2) and Ryan Hitchcock all scored for Worcester while Mitch Gillam made 25 saves in net for his 14th win of the season. Chris Nell made 25 saves in net in the loss for the Swamp Rabbits as Worcester improved to 13-7-3-1 on home ice this season. Worcester won for the first time all season when trailing after 40 minutes (0-13-1) and scored three power play goals in an 8:48 span in the third period for the comeback win to erase a 2-0 deficit through 40 minutes. A rather ho-hum first period saw Greenville grab a 1-0 lead as defenseman Luke Ripley (2nd) fired a 50- foot bomb off the post and past the blocker of Mitch Gillam at 16:54 for the only score. Shots were 9-8 in favor of Worcester through 20 minutes of play. Dylan Vander Eshe (8th) deflected a point shot that skipped through the pads of Gillam just three minutes into the second period to give Greenville a 2-0 lead. Mike Cornell dropped the mitts with Brendan Harms at 6:30 as the Railers captain tried to shift the momentum in favor of Worcester. The Railers trailed 2-0 after 40 minutes with the Swamp Rabbits holding 20-19 shot edge. Worcester would score three power play goals in the third period within an 8:48 spell to take a 3-2 lead. Ryan Hitchcock (7th) got the Railers on the board with a tough angle shot through a screen at 4:55 and Tyler Barnes (17th) would tie the score with a rebound strike at 8:03. Barnes (18th) would net the game winner deflecting an Ivan Kosorenkov shot through netminder Chris Nell at 13:43 to give the Railers the 3-2 lead. Mitch Gillam held down the fort the rest of the way and Tyler Mueller was sound defensively as Worcester came away with the 3-2 home victory. Notes: Three Stars: 3rd star: Luke Ripley (Goal) 2nd star: Ivan Kosorenkov (2 assists) 1st star: Tyler Barnes (2 goals) …. final shots were 28-27 in favor of Worcester…. Chris Nell (10-17-2) made 25 saves on 28 shots for Greenville.…. Mitch Gillam (14-11-2) made 25 saves on 27 shots for Worcester while Evan Buitenhuis was the backup….Worcester went 3-for-5 on the power play while Greenville went 0-for-2…. Kyle McKenzie (inj), Woody Hudson, Bo Brauer, Alex Vanier (susp), and Malcolm Gould did not dress for Worcester…. Jeff Kubiak is on recall with the Bridgeport Sound Tigers… defenseman Tyler Mueller returned to the lineup after missing the last six games due to injury…Tyler Barnes now has a franchise record seven-game point streak (7-3-10) and has set a Railers record with goals in five straight games……..Ryan Hitchcock has points in four straight games (2-5-7)…Ryan MacKinnon (1-3-4) has a four game point streak….it was the first time the Railers scored three power play goals in a game all season….Mike Cornell, Ryan MacKinnon, Barry Almeida, and David Quenneville also picked up assists…Quenneville led the Railers with five shots on goal. On Saturday, Feb 9 the Railers host the Wheeling Nailers at 7pm on a BIG GAME SATURDAY on PINK IN THE RINK presented by Rampco Construction and JLA Contracting! The Railers will wear a special pink jersey to benefit the Cup Crusaders as the DCU Center ice will be painted pink to raise awareness for breast cancer! Every Saturday night home game is SATURDAY NIGHT SIGNINGS presented by MidState Auto Group with a Railers player signing autographs during the first intermission. Tickets start at just $15 by calling 508-365-1750!